This is guest post by Conor Henrie. For years, we’ve been hearing about the next big thing in the connected home. Whether it’s connected ovens, connected lights, connected TVs, pretty much every appliance imaginable appears to be “smart” as we settle into 2017. The market has continued to grow rapidly, however it has not gone entirely mainstream due to one simple factor: complexity. Most smartphone users may be comfortable with operating their iPhones at this point, but the connected home is a much more daunting environment. The proliferation of smart-enabled hardware has made the possibilities nearly endless, but without a unifying device, progress has been more difficult than anticipated. The battle to be the dominant smart hub is intensifying, as the big tech players are all pursuing overlapping strategies. Amazon, Google and Apple are some of the key names making a play to be the robotic voice in your home, with a focus on sleek hardware and simple, open software design. Amazon and Google are pursuing a very similar strategy of building a smart assistant and spreading it through various devices. Amazon’s Alexa voice assistant can be used through Amazon’s Echo, Echo Dot, Tap, FireTV, with the larger devices also serving as quality Bluetooth speakers. Google’s Assistant runs through Google’s Pixel smartphone, as well as Google Home, and may be included in future Android Wear devices. Apple’s Siri runs through Apple devices, including iPhones, iPads, Apple Watches, Apple TV, and Macs. What all three competitors have done is create the assistant, spread it through their own devices, and make the software open to connect with third party devices. 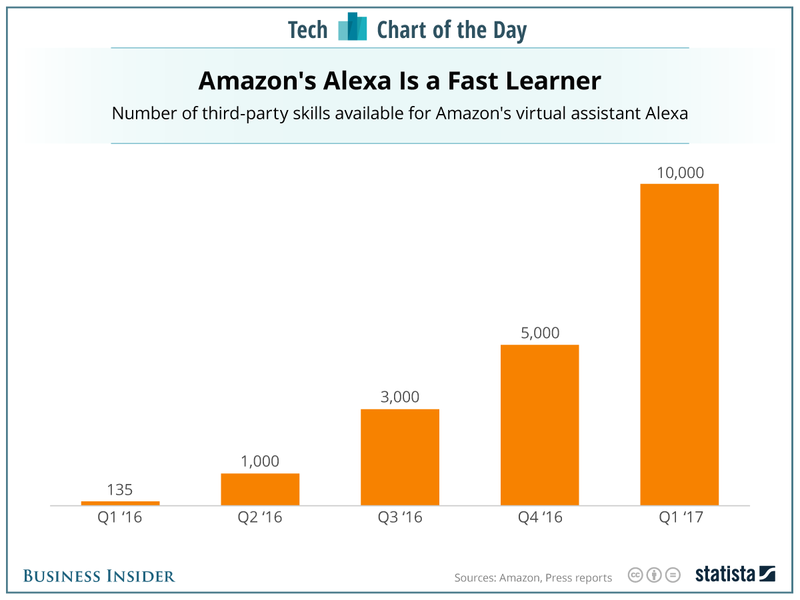 However, Amazon’s Alexa strategy is slightly different, and may allow it to continue to lead in the market. At the Consumer Electronics Show (CES) in early January, Amazon showcased a relatively novel strategic push. This is an ingenious move, allowing Alexa to spread throughout the entire home, rather than simply through consumers who make an active choice to buy Amazon products. Amazon has a truly comprehensive strategy, integrating home automation with e-commerce using a massive ecosystem of developers. With the Echo products serving as a standalone device, capable of high quality audio in the case of the largest Echo, Amazon can sell the hub as a speaker and then upsell the smart home capabilities. Also important to note is the variable nature of the price points, with the Dot ($50) serving as an entry-level product and the Echo ($150) as the premium. Amazon’s advantage comes from the openness of its ecosystem, which currently features over 10,000 ‘skills’. This is a network that none of their competitors can match. Additionally, as Alexa begins to show up in places other than our Amazon devices, the ease of use will become second nature. Apple’s strategy in the connected home is almost entirely based on its own devices, in particular the flagship iPhone, iPad and Apple TV. Using the Home app, or by talking to Siri, users can control connected home devices which work with Apple’s HomeKit. However, the weakness currently for Apple is the light partnership ecosystem they have fostered – the security requirements are high, and Apple’s products work with a comparatively small OEM (Original Equipment Manufacturer) network, particularly when compared with the openness of Amazon. Apple will continue to have a stronghold in this market, simply via the fact that Siri comes with the industry dominating iPhone – think of how easily Apple Music took off thanks to the iPhone as a parallel. By using Siri for every day tasks, such as a text message reply, customers become used to the idea of talking with the virtual assistant. As Apple’s smart home capabilities improve, it will be a natural upsell for iPhone, iPad and Mac users to talk with Siri to control their smart home. The challenge will simply be a lacking ecosystem as well as the non-existence of a standalone Siri device a la Amazon Echo and Google Home. Google is pursuing a hybrid strategy of Apple and Amazon, with a Siri competitor (Google Assistant) that functions in an iPhone competitor (Pixel), and an Echo-competing device (Google Home). By taking on all main facets of the market head first, Google is in a great position to leverage their brand and make a mark quickly. The Google Home is expected to take significant market share from Alexa in the coming months, burgeoned by the excellent reputation of the Google Assistant and a sleek design. As Google continues to push into the smartphone market, the Google Assistant will proliferate further, creating an ecosystem effect similar to that of Apple, where users will be accustomed to the idea of talking with their virtual assistant. The problem for Google in the near term may be differentiation. If I have an Echo, why should I go buy a Google Home? The question remains important as Google tries to pry customers away from their Echos and iPhones. As always, this depends on what you consider winning. All three companies are massively successful and all three are experiencing success in the space – they will all have net positive outcomes from entering this market. As it does not seem like a market where there needs to be a single winner, it is completely feasible that Apple, Google and Amazon can all exist, and even thrive, in the connected home market. It does seem most likely, however, that Amazon’s Alexa and Alexa-enabled devices will continue to lead the charge. The brand recognition combined with their ability to control the retail experience via Amazon.com provides a strong head start for Amazon in this impending battle. Additionally, the two main traits that are separating Alexa – ecosystem openness and placement in non-Amazon hardware – are generally unique to Amazon. Apple and Google (to a lesser extent) may not be completely willing to open their platforms quite as much, and as Alexa continues to pop up in our cars, homes, and even fridges – it’s easy to see how Amazon can continue to lead the pack in the connected home industry. Conor Henrie is a Senior Business Analyst in the Technology Strategy Consulting industry.